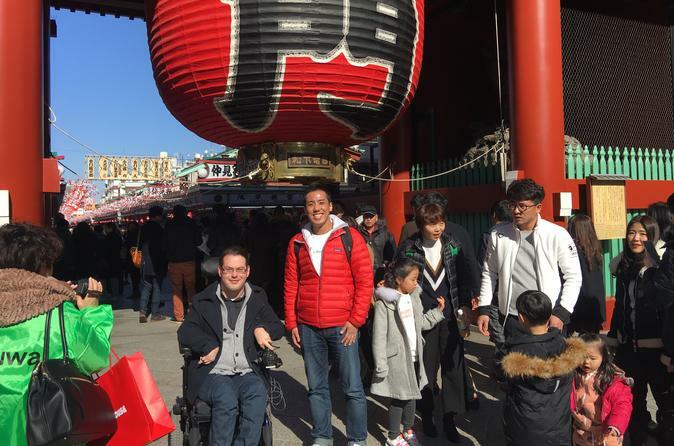 Learn about Japanese culture and see the highlights of Tokyo on this 7-hour wheelchair accessible tour for a private group of up to 4 people. Your friendly and knowledgeable guide will meet you at your Tokyo hotel and assist you in traveling between sites using the convenient Japanese public transportation system (transportation costs for both yourself and your guide will be at your own expense). Enjoy a recommended itinerary or customize the tour based on your group's preferences. Train station workers and your guide will assist you in getting on and off the train at your desired locations. Begin your full-day wheelchair accessible tour by meeting your guide at your accommodation in central Tokyo (23 wards) around 9am. Your friendly local guide will teach you about Japanese culture and lifestyle and accompany you to each destination using Tokyo's public transportation system. Please note that train fares for yourself and your guide will be at your own expense. You may customize your itinerary based on your travel date and interests; a sample itinerary is provided below. Travel to Tsukiji fish market by train and explore the outer market area to see a wide variety of fresh fish and learn about Japanese food. Transfer by metro to reach Asakusa, one of the most popular sightseeing spots in Tokyo. Immerse yourself in a traditional Japanese atmosphere by visiting Sensoji Temple and Nakamise shopping street.